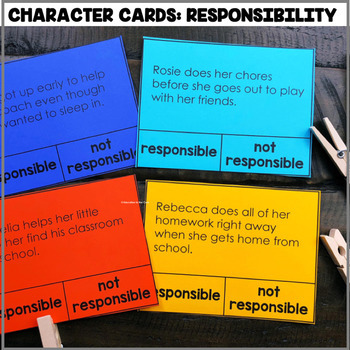 This "Character Cards: Responsibility" Center is a part of the December Centers Bundle for 2nd Grade! Character awareness is so very important in any grade. We thought it would be important to integrate literacy and character into each month. This month, the students will be reading the character card and clipping whether or not it is responsible. RL.2.3: Describe how characters in a story respond to major events and challenges.